The Knights of Columbus Council 14255 sponsors a Pro-Life Essay Contest in the month of January to coincide with the March for Life and local pro-life events. Grade 7 students were asked write an essay or poem to reflect the general theme of respecting life, including thoughts on abortion, euthanasia, and the role that the Catholic Church plays in promoting a culture of life. The Knights of Columbus Council 14255 sponsored the 8th annual Pro-Life Essay Contest this year. Grade 7 students from St. Sebastian School were asked write an essay or poem to reflect the general theme of respecting life, including thoughts on abortion, euthanasia, and the role that the Catholic Church plays in promoting a culture of life. A Council committee reviewed the entries from selected finalists and determined the winner. On March 11, 2019, it was announced that Clare Rothkopf is the contest winner this year. Clare received a $100 VISA gift card which was funded by the Council. Her poem is being published in today's bulletin. We are especially grateful to teacher Sally Weakland who worked with the students directly to assist with the contest. We also thank school principal, Mr. Rohr for allocating time for the award presentation with the 7th grade class. We are very proud of our students who took the time to write. All of the essays and poems were very thoughtful. It is encouraging to see that they understand what is means to be Pro-Life. The Knights of Columbus Council 14255 sponsored the annual Pro-Life Essay Contest in April. Grade 7 students from St. Sebastian School were asked write an essay or poem to reflect the general theme of respecting life, including thoughts on abortion, euthanasia, and the role that the Catholic Church plays in promoting a culture of life. A Council committee reviewed the entries from selected finalists and determined the winner. On May 15, 2018, it was announced that Kathryn Kastelic is the contest winner this year. Kathryn received a $100 VISA gift card which was funded by the Council. Her poem is being published in today's bulletin. We are especially grateful to teacher Sally Weakland who worked with the students directly to assist with the contest. We also thank school principal, Mr. Rohr and Miss Moskaluk for arranging for the time for the award presentation with the 7th grade class. A Council committee reviewed the entries from selected finalists and determined the winner. On February 4, 2016, after the school Mass, it was announced that Matthew Dennee is the winner of this year's contest. Matthew received a $100 gift card to Barnes and Noble which was funded by the Knights of Columbus Council #14255. His essay is being published in the today's bulletin. We are especially grateful to teacher Miss Sally Weakland who worked with the students directly to assist with the contest. Second and Third Place runner-ups were Abigail Minear and Connor Beaven. We are very proud of our students who took the time to write. All of the essays and poems were very thoughtful. It is obvious that they understand what is means to be Pro-Life. The Knights plan to have the contest again next year. 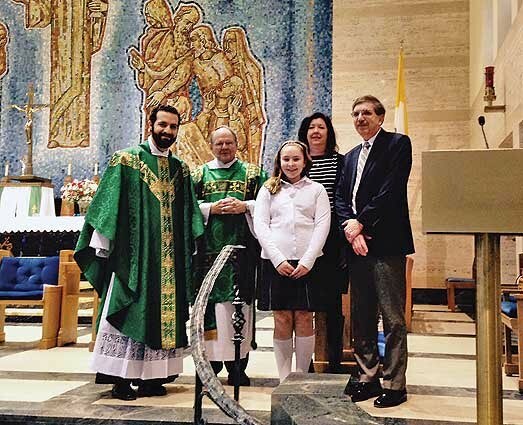 St. Sebastian seventh-grader Nora DeKemper has been selected as the winner of the Knights of Columbus Council No. 14255’s fourth annual Pro-Life Essay Contest held in January to coincide with the March for Life and local pro-life events. Seventh-grade students from St. Sebastian School were asked write an essay or poem to reflect the general theme of respecting life, including thoughts on abortion, euthanasia and the role the Catholic Church plays in promoting a culture of life. A Knights Council committee reviewed the entries from selected finalists, and Trustee Ted Varga announced the winner Jan. 29. Shown above right, from left, are the Rev. Peter Kovacina, Deacon Terry Peacock, Nora, School Principal Sandie Isabella and Varga. Former Grand Knight Jeff Davis also was in attendance. Nora received a $100 gift card to Barnes and Noble and her poem was published in the church bulletin. We are especially grateful to teacher Miss Sally Weakland who worked with the students directly to assist with the contest. We are very proud of our students who took the time to write. All of the essays and poems were very thoughtful. It is obvious that they understand what is means to be pro-life. The Knights plan to have the contest again next year. On January 30, 2014 after the school Mass, it was announced that Sophia Thomas is the winner of this year's contest. Sophia received a $100 gift card to Barnes and Noble which was funded by the Knights of Columbus and presented by Council Trustee Ted Varga. School Principal Sandie Isabella and former Grand Knight Jeff Davis were also in attendance. The poem is being published in the church bulletin. We are very proud of our students who took the time to write. All of the essays and poems were very thoughtful. It is obvious that they understand what is means to be pro-life. At the school assembly on February 1, it was announced that Katelyn Bartos is the winner of this year's contest. Katelyn received a $100 gift card to Barnes and Noble which was funded by the Knights of Columbus. Her poem is being published in the February 10, 2013 church bulletin. Other finalists were Michael Maguire, Greg Klamert, Erin Wagner, Jacob Weber and Danielle Kastor. We are very proud of our students who took the time to write. All of the essays and poems were very thoughtful. It is obvious that they understand what is means to be pro-life. The Knights plan to have the contest again next year. The Knights of Columbus Council 14255 sponsored a Pro-Life Essay Contest in the month of January, 2012 to coincide with the March for Life and local pro-life events. Grade 7 students were asked write an essay or poem to reflect the general theme of respecting life, including thoughts on abortion, euthanasia, and the role that the Catholic Church plays in promoting a culture of life. At the school assembly on February 1, 2012 it was announced that Kasey Williams is the winner of this year's contest. Kasey received a $100 gift card to Barnes and Noble which was funded by the Knights of Columbus. Her poem was published in the church bulletin. Other finalists were Katie Beitko, Sara Jackson, Annaliese Micozzi and Chase Bills. In the photo of the presentation, Kasey Williams is wearing #19!